"Nitwit Hollow" Collection is not the spooky kind of Hollow...but the charming kind of Hollow! What do you find here?? Well, have a look! These busy gnomes have planted flowers and made a garden, built a house, and truly created a life for themselves here. The foliage keeps them busy each day, but there's always time for friendship and love in this ideal little setting. 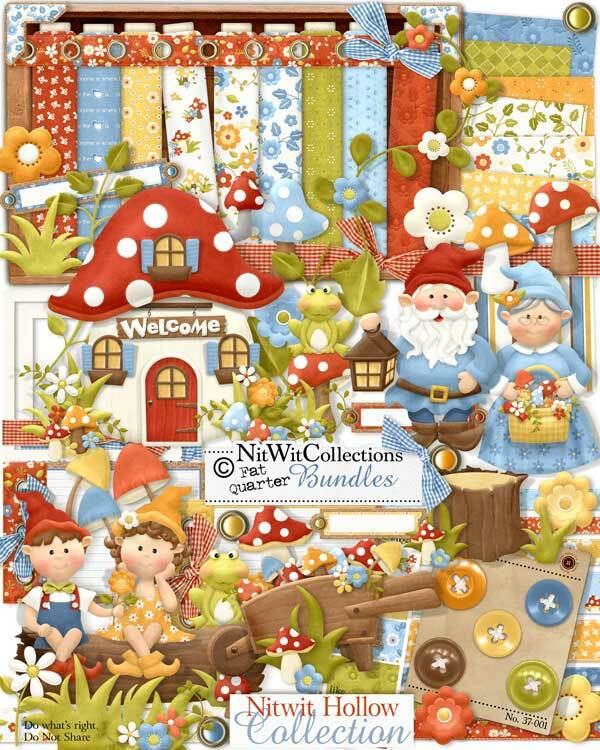 This is the perfect kit for gardening, friends, home/house, and even a grandparents theme as you will see in our card below. 2 Branches - we don't want to over prune at this time of year!! 2 Frames - perfect for photos or highlighting a main element in your layouts and cards! 1 Frog sitting on his toadstool - what a better way to spend a day! 1 Log - hollowed out....who lives or plays here?? 4 Photo corners - kind of easy to figure out how to use these...no? ?